On 2 March we were joined in a webinar by Rachel Harris and Sheena Fletcher from Glasgow Centre for Population Health. As with previous #ScotPublicHealth #PublicHealthHour sessions this gave us an opportunity to talk about a Public Health topic while also learning techniques in social media and wider engagement. In this session we learnt about assets-based approaches to health and some social media techniques including use of infographics. 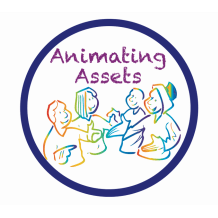 Rachel, GCPH researcher, told us about her work with Scottish Community Development Centre on Animating Assets (full report). Rachel’s slides are available as a Slideshare. The approach and purpose of the Animating Assets work differed between Glasgow and Edinburgh. The full report explains this and other details, including a series of case studies, and is well worth a read. Sheena, GCPH E-Comms Officer, then took us through a Prezi on GCPH’s approach to online engagement. Check out the previous blog for examples of GCPH infographics. GCPH has developed an effective and multi-platform approach to engaging with their staff, partners and wider audience (eg Twitter, Facebook, blog, website, YouTube and Storify). Infographics have been an important part of this engagement and play an important role in the centre’s dissemination of research findings. Simple tips on use of images, hashtags and links can have a major impact on the success of a tweet. During the session we asked participants in the #PublicHealthHour to tweet examples of infographics. There are some great examples from other organisations in this Storify, with some highlights below. Thank you again to Rachel, Sheena, #publichealthhour participants and everybody who helped promote the session. Over the 24 hour period around the session #ScotPublicHealth achieved over quarter of a million impressions, with 155 tweets/ retweets and 60 participants. (Tweets = tweets and retweets; mentions = tweets and retweets mentioning the named person; data from Symplur).